What is the story behind Huski? Do you deliver throughout France? I’ve placed my Huski order – what happens next? When I buy a COOK dish in the Alps will it cost the same as in the UK? And if not, why does it cost more? Will my kitchen accommodate my order? Huski is an online store with a wide-range of meals, drinks and services. Our team delivers daily, direct to your chalet or apartment, or you can click-and-collect on your drive up the valley. Our mission is to take the hard work out of your ski holiday, giving you more time to enjoy the mountains. We offer a selection of meals from established and well-known partners, like Cook Food from the UK. As we grow we will keep working with local restaurants and suppliers to bring the best of the Alps' food to our customers in the most convenient way. We have a fantastic team of ‘huskis’ who can always be relied upon to deliver your order whatever the weather. All our team are mountain enthusiasts, so it’s worth tapping into their expertise about where to go or what to do whilst you are here. The idea for Huski came from two friends, who’d had enough of the legwork involved in their annual family ski holiday together, and decided there had to be a better way. Inspired by the simplicity of apps and delivery services back at home, they got their heads together to build a mobile delivery service that was custom made for the mountains. So Huski was born. And like any good Huski we promise to be loyal, hardworking and happy to get the job done. Like any online store really. Choose what you want and add it to your basket (sorry, Sled). You can shop by pre-planned menus, or you can shop by individual dishes. We also have Welcome Packs for basic groceries designed to get you through the first day if you are arriving after the shops are closed. If you are booking before you travel we will need your day of arrival and your address. We aim to have everything in place before you arrive. Or if you are booking once you are in the resort just pick one of our daily delivery slots when you get to the checkout on the site. We cannot accept cash but we can take a range of payments from card, to Paypal to Apple Pay. You can place orders 24/7 through our online store. We deliver daily, with a range of bookable time-slots typically from 2pm to 8pm. Our headquarters in Bourg-St-Maurice are also open for our click-and-collect service in office hours, with extended hours on Saturdays for late arrivals. Once the order is placed and packed up we will deliver it ourselves direct to your door. It will arrive frozen and oven-ready. If you have ordered before travelling we will make arrangements with your accommodation provider to make sure it’s all in place for your arrival. 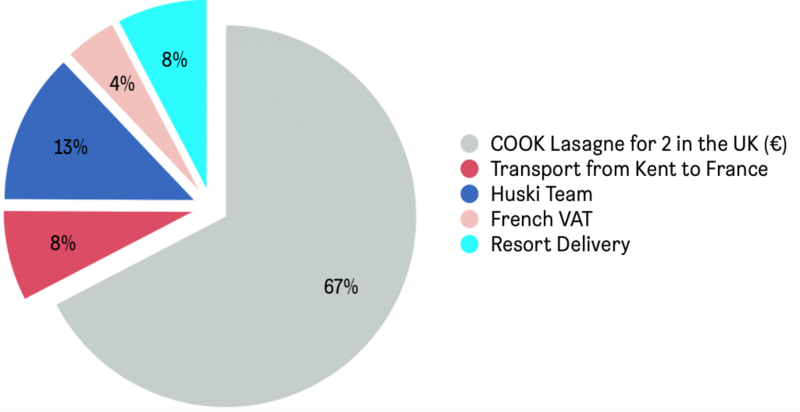 We Huskis are able to deliver to all 250* resorts in the Alps! We are based in Bourg Saint Maurice and send out members of the pack daily to bring delicious oven-ready food to your door. *we deliver to the 3 Valleys and Tarentaise every day. Further afield resorts are delivered to 2 or 3 times a week depending on orders. You are able to choose your preferred delivery day when you check out. You can choose your resort at the top of the shop page to see our delivery charge including the free delivery threshold, minimum order value and days of the week we deliver to the resort. We currently only work within the Alps and do not yet offer delivery to the Vosges or Les Pyrenees but please follow our social media channels for future expansion and news. No. You can order until 8pm the night before for delivery the next day, depending on where you are located in France and which delivery days are scheduled for those regions. No. But on orders under €75 you will be charged a delivery fee. Sit back and relax. If you have pre-ordered well in advance of your trip then you may not hear from us for a while but we do have your order and will get it ready for your arrival. You will receive a reminder email a couple of weeks before you travel and this is the opportunity to check that information such as address and preferred delivery time slots are still up to date. We sometimes offer voucher codes through businesses we are working alongside, or perhaps for a special promotion. You can redeem your code when you check out of the site where there is a field saying ‘add voucher code’. You can’t change or amend your order online, but if you need to make a change you are able to email [email protected] if it is greater than 48 hours of your scheduled delivery time. You can cancel your food delivery and receive a full refund if it is 7 days or more prior to delivery. After this time, we are unable to offer a refund as our products have already started to be processed ready to bring to you. We never want to pull you off the slopes. When you complete your order online we’ll ask you for a preferred delivery time slot (usually between 2pm and 8pm) and we will work to get as close to that as possible. We will need your accommodation address, and as much information as possible always helps our Huskis navigate! Please bear in mind that weather and road conditions in the Alps can be changeable. All orders are taken via our online shop. If you are having any issues with the website, please call +33 (0)479041536 or email [email protected] to talk to one of our team. A standard delivery charge (free for orders over €75) will apply to all resorts in the 3 Valleys, Espace Killy, Paradiski and satellite resorts of these ski areas. An additional delivery fee will apply to resorts in the Alpes Maritime (Isola 2000), Chamonix basin, Portes du Soleil, Les 2 Alpes and Alpe d'Huez. Chalet Chef: When passionate foodie Clarinda met classically trained chef Matt sparks flew and they began a culinary journey together. They call their style “gourmet gourmand” - combining their creativity in the kitchen with their love for travel, taking pleasure in learning traditional recipes and incorporating fresh local ingredients. When they came to the Alps in 2014 lured by a shared love of the mountains, their cuisine became inspired by the centuries old traditions of the Savoie. In these beautiful but harsh mountains, where folk still live off the land like they always have, and cows graze the lush mountains plumply and freely; where cheese is still hand-churned and pre-sliced bread is considered heresy - rearing ingredients is no simple feat. Matt and Clarinda developed a deep appreciation for the work and challenges involved in producing the fresh, local ingredients that they had become so passionate about and grew determined to give their mountains the place on the culinary map it deserves; to celebrate the rustic simplicity of century old “tummy hug” recipes and elevate them into something new, exciting and indulgent. We make sure all our food is packaged so it gets to you in peak condition. Frozen products from our COOK range will be refrigerated in transit and should be popped in your freezer on arrival. If you don’t have enough freezer space it can be kept in the fridge for 48 hours. Our Welcome Packs will arrive in a box and are a selection of packaged goods and fresh items like bread, eggs and milk. These packs should be stored or refrigerated as you would any grocery products. We set out to create the best Vegetarian menu in the Alps and we think we have pulled it off. These menus deliver a mix of tried-and-tested vege dishes from the UK’s ‘Cook’. Who says you can’t eat delicious and healthy vegetarian food in the Alps? Yes we do. We know a large number of our customers want to or need to cut out wheat which isnt so easy in the mountain diet. So we created a terrific Gluten Free range of dishes. This is also our healthiest menu catering not just to guests who want to avoid certain ingredients but also to the healthy-minded who want to eat cleanly. But healthy should also be tasty, so here you can enjoy a range of local and international dishes packed with flavour and energy. We are afraid it’s true....when we deliver a COOK meal to you in the Alps you will be paying more than you’d pay in the UK at your local COOK shop. Typically it will be about 60% more. But that’s not because we are greedy! It’s just that we must cover our costs and pay a few taxes along the way as we transport these delicious creations the 700-odd miles from COOK’s kitchens in Kent to your kitchen in the resort. A large majority of accommodation in the French Alps only has a small freezer. But don’t worry! Our food can sit in a fridge comfortably for 48-72 hours. If you have a freezer you can order as much food as you like. If you have only a fridge you can still order up to 3 night’s worth of food. We can always do a second delivery if you would like more! If you order from our 6 day menu we even do a second delivery at no extra charge. This way you can enjoy 6 nights of Huski’s food. Please also check that the kitchen has either an oven or a microwave. Please be aware that some accommodation only provide you with either an oven or a microwave, but not always both. Sometimes the microwave is a ‘combi-oven’ or a ‘microwave-grill’. This means that our ‘oven-only’ meals will not cook in a microwave-grill- and anything bigger than a ‘serves 2’ will not fit in a combi-oven. When ordering your meals, please check your kitchen’s facilities. All of our dishes have a microwave and/or and oven symbol in the description. We also have a handy filter column on the left hand side of our website.